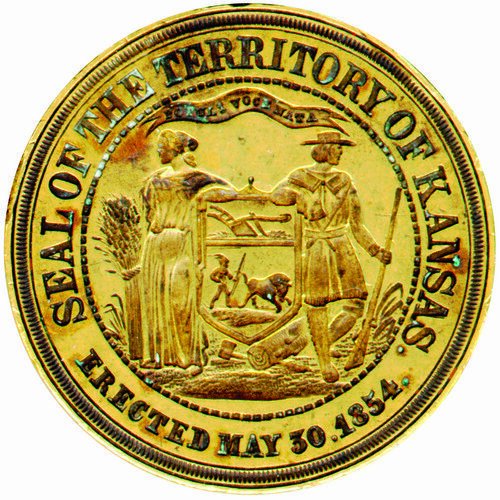 The Kansas territorial seal supposedly was engraved by Robert Lovett of Philadelphia from a design developed by Andrew H. Reeder, the first Territorial Governor of Kansas. The face features a pioneer holding a rifle and hatchet opposite Ceres (the goddess of agriculture) who stands next to a sheaf of grain. At their feet lie a tree and the axe that felled it. Between these two figures is a shield with a plow in the top compartment and a hunter stalking a buffalo below. Above the shield is a banner reading, "POPULI VOCE NATA." This Latin motto has been translated to read "Born by the voice of the people" or "Born of the popular will." The motto speaks directly to the Kansas-Nebraska Act of 1854, creating the territory and establishing popular sovereignty whereby voting residents would decide if Kansas became a slave or free state.